FIRM HISTORY: The firm was started by Ms. Graff in March, 2003. Mr. Graff joined in March, 2011. Combined, the Graffs have over 20 years experience as attorneys assisting clients solve their legal problems, at the trial and appellate court levels. When considering mediation and alternative dispute resolution, the Graffs have over 30 years of combined experience. McKELL GRAFF, PLLC is a family centered law firm, providing attorney representation, mediation, collaborative law, and coaching for do-it-yourself clients in the following areas of civil law. FAMILY LAW: - Dissolution, Legal Separation, and Decree of Invalidity (Annulment) - Qualified Domestic Relations Orders (QDRO), and other retirement plan orders - Paternity Establishment, Parenting Plans, and Child Support Orders - Modification of Parenting Plans and/or Child Support - Open Adoption Agreements - Step-parent Adoptions - Family Law Contracts -- - Pre- and Post-Nuptial Agreements -- - Community and Separate Property Agreements -- - Partnership Agreements (same-gender couples) - Emancipation JUVENILE: - Dependency and Termination of Parental Rights ELDER/ESTATE PLANNING: - Wills, Powers of Attorney, Medical Directives - Revocable Living Trusts - Community and Separate Property Agreements - Guardianships - Elder Issues The Firm hosts and sponsors SW Washington Second Saturday - A Divorce Workshop for Women (a Washington non-profit organization) - For more information, go to www.swwashingtonsecondsaturday.com or find it on Meetup Groups. Our lawyers have 25 years combined experience in the areas of family, elder, and juvenile law. We are a family centered law firm. The partners, Meredith and Eugene Graff, have been married over a quarter of a century, and use their conflict resolution skills at home and at work. Meredith McKell Graff has been a mediator since 1983 and her philosophy is to find peaceful solutions to difficult issues at the lowest level of conflict. She focused on elder issues in law school and practiced family law and estate planning for fifteen years before focusing on estate planning/elder law and mediation in family and elder issues. She founded the law firm in 2003 and is the managing partner. Eugene M. Graff began working in the juvenile dependency area while in law school as a law clerk at the Washington Attorney General's Office. After graduation, he represented parents in juvenile dependency cases before being appointed as Assistant Attorney General for Washington in this area of law. He has been a partner in the law firm since 2011 and has a 100% contract with the Washington Office of Public Defense to represent parents in juvenile dependency matters. His work is entirely court appointed. Faye E. BreitReed focused on family law at Northwestern School of Law at Lewis and Clark University and joined the law firm as a law clerk her last year in law school. She has been an associate attorney with the firm since November 2013 and works in the area of family law and is being mentored in juvenile dependency cases. We take a personal interest in our clients and our goal is to make the legal experience less frightening. Many of our clients have never encountered the legal system before coming to us, as well as being in an emotionally charged situation. Our goal is to help our clients navigate the unfamiliar legal system and help them have the best resolution possible given their particular circumstances. Ms. Graff founded McKELL GRAFF, PLLC in 2003. Prior to that, she worked as an associate in the area of Family Law with the Longview, Washington law firm, WALSTEAD MERTSCHING, P.S., and as a Family and Elder Law mediator with the Portland, Oregon law and mediation firm of STEVEN ALLEN SMITH, P.C. She is actively licensed to practice law in the state of Washington, and is licensed, but currently on inactive status, as a Utah attorney. Ms. Graff is a graduate of University of Utah's S.J. Quinney College of Law, in Salt Lake City, Utah, where she focused her law studies in the area of Elder Law. She holds a masters degree in English (Creative Writing/Poetry) from Rutgers University Graduate School in Newark, New Jersey. She obtained her bachelors degree in Denver, Colorado from Loretto Heights College, which merged with Regis College to create Regis University. Ms. Graff has been trained in divorce and custody mediation since 1983, where she trained with the Center for Dispute Resolution, now known as CDR Associates, in Boulder, Colorado. She received additional mediation training in law school, during which she also served as a volunteer mediator in the Murray City (Utah) Small Claims Court. She has mediated hundreds of hours in which most of her cases settled. She recently became certified with Washington Mediation Association and id a member of the Clark County Association of Mediators. Ms. Graff is a member of the American Bar Association, the Utah and Washington State Bar Associations, the Clark County (WA) and Cowlitz County (WA) Bar Associations. She holds memberships in the Washington State Bar Family Law and Dispute Resolution Sections, the Association for Conflict Resolution, and Collaborative Professionals of Washington. She has served as Vice-President of the St. Helens Chapter of Washington Women Lawyers and was President of the Clark County Bar Family Law Section. She was Secretary of the Cowlitz County Bar Association in 2003, and served on the board of Cowlitz-Wahkiakum Legal Aid from 2002-2004. She volunteers for Southwest Washington Volunteer Lawyers Program. Law is a second career for Ms. Graff, having taught college writing courses for eight years at Rutgers University in New Jersey, and Weber State University and Salt Lake Community College in Utah. Ms. Graff has taught hundreds of students as an adjunct professor and sees her teaching skills as an important part of her law practice as she continues to teach her clients about how the law impacts their lives. Ms. Graff also worked in the insurance industry in New Jersey during and after graduate school and was licensed to sell life, health, disability, and property and casualty insurance products, and held a National Association of Securities Dealers (NASD) Series 6 license. Ms. Graff received numerous awards and recognition during her tenure as a financial services representative, sales manager, and later, underwriter for one of the largest insurance companies in the U.S.
Ms. Graff is the author of a chapter in the book, Contested Landscape: Wilderness Policy in Utah and the West, ed. Dan McCool, Ph.D. and Doug Goodman, University of Utah Press, 1999. She is also the author of the poetry manuscript, "Mischpocha," a selection of family-themed poems. She is working on a book with her mother, Letters From Africa, which tells the true story of her parents' life in Kenya, Africa while her father was on his second professorial sabbatical leave. Ms. Graff's father, Cyrus M. McKell, Ph.D., was a botanist who has specialized in drought-tolerant plants. Ms. Graff is the mother of four grown children. She fought, and lost, custody of them when they were ages 10, 8, 6 and 3, two years after a divorce. It is that experience that informs and fuels her desire to promote mediation, collaboration, and conciliation in family legal matters. Ms. Graff is also a breast cancer survivor, having been free of cancer since 1999. She is available to speak to groups about peaceful resolution of legal problems. Gene studied law at Willamette University, and obtained his J.D. in 2001; he was admitted to the Washington Bar the same year. He also has a Bachelor's of Arts degree in Graphic Design from Rutgers University and spent several years a graphic designer, art director, and art instructor before attending law school. Immediately prior to joining McKell Graff as a law partner with his life partner Meredith, Gene spent nearly 6 years as an Assistant Attorney General in the Vancouver Regional Services Division of the Washington Attorney General's Office (AGO), where he had an extensive litigation practice primarily in juvenile law in Clark, Cowlitz, occasionally, Skamania Counties. He gained substantial appellate experience at the state Appeals and Supreme Court levels during his AGO tenure, and participated in multiple Workers Compensation jury trials. More recently he also handled unemployment cases for the state Department of Employment Security. Gene has professionally lectured on the subject of the use of psychological experts in trial practice for the University of Washington's Court Improvement Training Academy (CITA) in Seattle and Federal Way, and served as panelist at the Children's Justice Conference in Seattle. Gene also served as a panelist at a Vancouver conference on the subject of child representation in dependency matters, and is a past member of the Region 6 Reasonable Efforts Symposium Committee, serving stakeholders in juvenile dependency practice in Clark, Cowlitz, and Wahkiakum Counties. He also served on the Clark County Juvenile Court Improvement Committee, which recommended and implemented changes in Clark County dependency court to minimize the amount of time parents spend in dependency court on the regular docket waiting for their cases to be called. Prior to joining the AGO, Gene spent nearly three years as an Associate Attorney for the Vancouver law firm of Greenen & Greenen, where he practiced law primarily as a parents' attorney in juvenile court. He also served as a court-appointed attorney for children and guardian ad litem for children and parents in juvenile court. In addition to his juvenile practice at Greenen & Greenen, he also represented landlords in landlord/tenant disputes, and gained experience cases in diverse areas such as contracts, business, real estate, construction defects, intellectual property, probate, family and criminal law. He also has experience in school law and mediation. As a new lawyer, Gene was taught to view the proper role of a lawyer as both an advocate for and a counselor to his or her client; as a veteran lawyer, he believes that more strongly than ever. While recognizing that sometimes trial is a necessary option, most cases settle without need for trial. Gene derives great satisfaction from assisting clients in settling their differences, as studies show, consistent with his own experience, clients are generally more satisfied with negotiated settlements than they are with trial results since they are more directly involved with the solution. 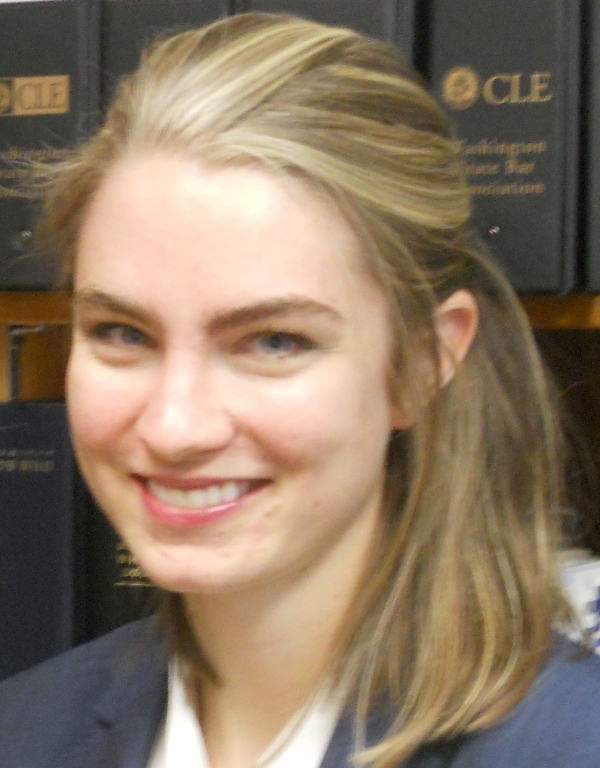 Faye is a 2013 graduate of Northwestern College of Law at Lewis and Clark University. She worked through law school, joining the firm as a law clerk her last year in law school. Her focus in law school was family law and she has been practicing family since she was admitted to the Washington State Bar Associate in November, 2013. She is respected by her colleagues and judicial officers as smart, tenacious, even tempered, and professional.